Exercise is an important part of recovery for people with brain injury, University of Queensland researchers have found. A review from UQ's School of Health and Rehabilitation Sciences uncovered the benefit of exercise on a particular protein involved in brain re-organisation and re-learning following a neurological disorder, such as after a stroke. Brain-derived neurotrophic factor (BDNF) proteins, found in the peripheral and central nervous systems, play an important role in brain development, plasticity and survival. PhD candidate Christopher Mackay said the review discovered that exercise could positively affect BDNF in people with brain conditions. "Increasing BDNF may contribute to the ability of brain cells to grow, change and rejuvenate, and a program of aerobic exercise may increase levels of BDNF in people with a neurological disorder," Mr Mackay said. "People with neurological disorders have potential to harness neuroplasticity – the ability of brain cells to grow, change and rejuvenate – to help their recovery of motor performance." The research team searched six electronic databases up until the end of December 2016, analysing 984 experimental or observational studies of people with neurological disorders who undertook an exercise intervention. Studies employed either a program of aerobic exercise, a single bout of aerobic exercise, or both. Mr Mackay said that the results propose a new and unique interpretation of the benefits of exercise for people with neurological disorders. 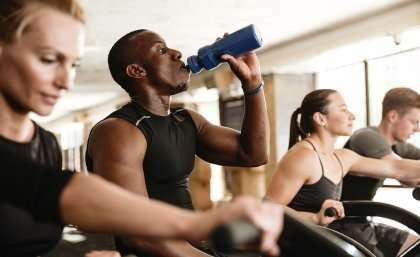 "Several mechanisms have been proposed to explain the positive impacts of aerobic exercise, including increased blood flow in the brain, changes to neurotransmitter release, structural changes in the central nervous system, and altered arousal levels," he said. "Now we have evidence that aerobic exercise has a positive impact on levels of BDNF in neurological patients. "Including regular aerobic exercise as a component of rehabilitation may show improvements in walking, functional ability, and improved motor performance." The review is published in Neural Plasticity journal.